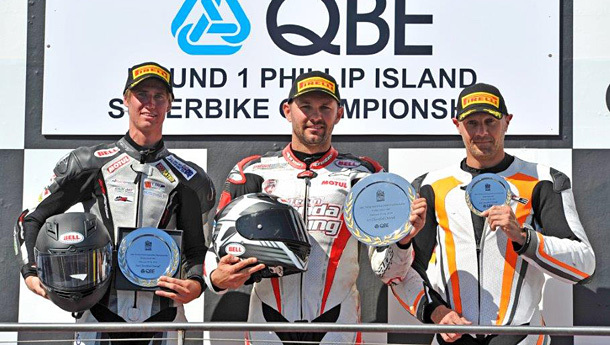 Jamie Stauffer (above) has cruised to victory in the second national superbike race at Phillip Island after his Honda teammates Wayne Maxwell and Josh Hook hit the deck in jarring, and bone-crunching circumstances. It all happened on lap one when Hook crashed at turn 11, which left the trailing Maxwell with nowhere to go except cannon into his teammate’s stricken machine. Both were injured: race one winner Hook broke a collarbone and wrist, and Maxwell dislocated his shoulder. It made for an unceremonious return to Honda for Maxwell, who also went down in race one. 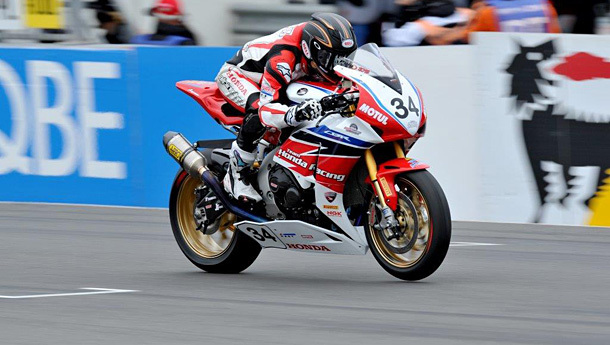 Maxwell won the Australian 2013 Aussie superbike title in Suzuki colours. With his main dangers out of the picture, Stauffer was unruffled in claiming a 2.802-second victory over Mike Jones in the 12-lapper, with Sean Condon third from Ben Henry and Dustin Goldsmith – all Kawasaki mounted. Condon was also the first prostock rider home. 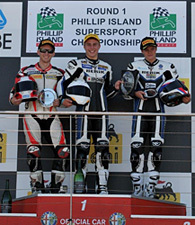 On the podium after race 2 L-R Mike Jones second, Jamie Stauffer first and Sean Condon third. Stauffer leads the Phillip Island Championship standings on 45pts, from Jones (38) and Adam Christie (BMW, 34), while Condon leads prostock on 50pts ahead of Henry (37) and Honda’s Chris Trounson (37). The supersport race saw Aaron Morris pip Daniel Falzon by 0.011 seconds, with Callum Spriggs and Matthew Davies whistling across the line close behind. All were aboard the Yamaha YZF-R6. Falzon is on 45pts from Morris (43) and Spriggs (38). A last lap blunder by Honda teammate Wayne Maxwell cleared the way for Josh Hook (pictured below) to claim an easy victory in the inaugural Phillip Island Championship battle at the Victorian seaside circuit. Hook and Maxwell were locked in a tight battle on the final lap of the superbike race when Hook, the leader, went slightly wide at turn nine (Lukey Heights), allowing Maxwell to slip underneath – but his ascendancy was short-lived after he lost the front end and speared off the circuit. 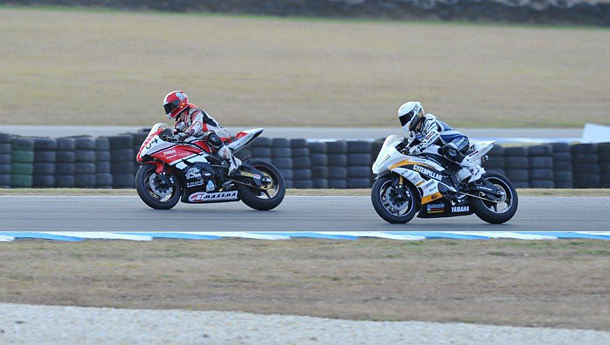 Hook then only had to canter to the finish line to claim his first superbike win at Phillip Island at a national level, with the third member of the Team Honda triumvirate, Jamie Stauffer, a lonely second from Queenslander Michael Jones (Kawasaki) making his debut in the superbike ranks. Prostock riders Dean Condon (Kawasaki) and Chris Trounson (Honda) were fourth and fifth, followed by New Zealander Sloan Frost on a BMW. Twenty-nine of the 34 starters made it to the finish of the 12-lapper, and Hook set the fastest lap of the race with a 1:33.166. Earlier, in the opening supersport race, Aussie champion Daniel Falzon edged out Callum Spriggs and Aaron Morris, while Matt Davies got the better of Samuel Lambert in the battle for fourth. The top four were on Yamahas, while Lambert was Triumph mounted. Aaron Morris leads Daniel Falzon in race 2. Phillip Island Motor Sports and the Australian Grand Prix Corporation have joined forces to launch the Phillip Island Championship at the world superbike meeting this weekend. The championship will conclude at the MotoGP round from October 17-19 – a total of four races for each category across the two meetings.